The recent history of relations between the US and Haiti has been an adversarial one. 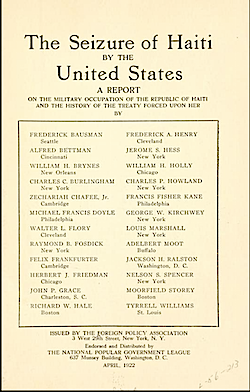 US foreign policy in Haiti has been controlled by right-wing elements in the US--with primary connections to the now deceased segregationist and racist Jesse Helms and his organization, the IRI, a subgroup of the National Endowment for Democracy--who were involved in the financing and sponsorship of two Coup D'etats in Haiti (the first on Sep. 30, 1991 and the second on Monday, March 01, 2004). The International Republican Institute (IRI) is not pro-democracy, though its objectives are stated to be democracy and trade. The real purpose of groups like the IRI, in countries of the global south is to promote anti-democracy elements by aligning with right-wing extremist elements of the countries they target. 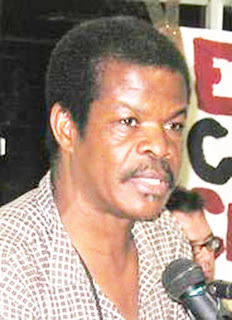 In Haiti, the mysterious Haiti Democracy Project (HDP) funded the creation of Group 184 (consisting of rich pro-business elements of Haiti's so-called "civil society") which in turn aligned with the armed "rebels" (their muscle) to form the threat that was the basis for the removal of Haiti's first democratically elected government--for the second coup. 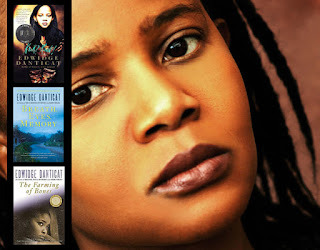 Haiti is a country that has lost thousands of its citizens--they were/are either dead or disappeared as a result of the chaos attending the upheavals of the coups. A conservative estimate of the toll was published in the Lancet in 2006 that documented 8,000 deaths and 35,000 rapes in Haiti since the second coup in 2004. Haiti is a part of a small island in the Caribbean. 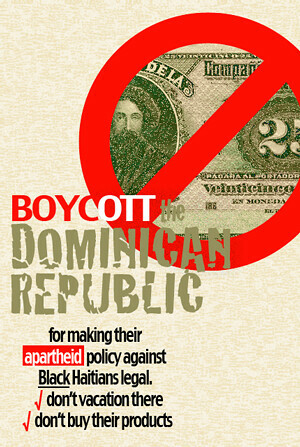 It is bordered on it's right by the Dominican Republic. The Dominican Republic is where so-called "rebels" (Bush's then Secretary of State, Colin Powell characterized them as "thugs and criminals") were trained and armed by their benefactor (the US) in preparation to the second attack on Haiti's first democracy. Members of these "rebels" had also been trained and financed by US Special Forces and the CIA, including wanted drug trafficker Guy Philippe and his associates, wanted murderers/assassins Emmanuel Constant and Jodel Chamblain. The United States of America--which is the world's number one super power--or has very good marketing apparatus that promotes the number one billing, is not and never was interested in promoting democracy in Haiti. The US government's foreign policy is aligned with the Haitian sweatshops and businesses that pay poverty/slave wages to Haitian workers. A typical Haitian worker averages about $3 a day. These unethical multinationals and their Haitian coconspirators see to it that the Haitian worker is exploited and deprived of every basic human right that is enshrined in the UN "Universal Declaration of Human Rights." The UN's stated objectives in the declaration make imperative the right for workers to earn a living wage. This requires that basic employment laws that protect workers from exploitation are in place. One basic right denied to Haitian workers is the right to form unions. What of this current UN mission in Haiti with the unfortunate and evocative acronym of MINUSTAH: United Nations Stabilization Mission in Haiti? The UN has now been occupying Haiti for the past five years under the pretext of bringing stability, after the violent kidnapping of the democratically elected government (which it supported), yet human rights for poor Haitians have not been a part of their mission. Perhaps this is because the security/stabilization they seek is for the multinational corporations and the Haitian rich business class to operate without oversight and to spare them the embarrassment of being called to account by an empowered native Haitian government? There are many more reasons for forming a political, strategical partnership with a country that has a standing army. Below is a list of the potential candidates. Readers are invited to list their own candidates and explore the pros and cons of a partnership between Haiti and a foreign political partner. The best candidate should have a standing army and be able to withstand any economic, military or diplomatic embargo initiated and supported by the UN Security Council. As of October 15, 2009, the five "permanent" (voting) members of the UN Security Council were: United States, France, China, UK and Russia. As of today October 16, 2009--five new "non-permanent" (voting) members were elected: Bosnia and Herzegovina, Brazil, Gabon, Lebanon and Nigeria. They join Uganda, Turkey, Mexico and Japan to make up the fifteen members voting members. According to the UN, "Under the Charter, all Members of the United Nations agree to accept and carry out the decisions of the Security Council. While other organs of the United Nations make recommendations to Governments, the Council alone has the power to take decisions which Member States are obligated under the Charter to carry out." During his UN speech in October, Libya's Muammar Gaddafi lamented the inequality among member states and criticized the Security Council as being ineffective because since its inception, 65 wars had been launched. Gaddafi also dropped the T-Bomb, calling the UN Security Council a "Council Of Terror." Unfortunately, the mainstream media in the US portrayed Gaddafi's speech as rambling and incoherent and the Guardian UK said it was mind-numbingly long. It would have perhaps been more constructive if they had focused on the substance of his first ever UN speech, instead of its length and entertainment value. Which candidate country would make the best political partner for Haiti? The Aristide government dissolved the Haitian army in 1995. President Aristide considered the Haitian military to be a primary source of oppression and an instrument used to make coups in Haiti. So, the political partner must have a standing army that fills that gap for Haiti. This is just one consideration, but a paramount one in a political partner. It would be constructive for a Haitian government which seeks autonomy to weigh the pros and cons in making a decision as to whom to approach about this matter. Conversely, any potential partner would have to be assured that the pros outweighed the cons in any partnership undertaken with the Haitian people. 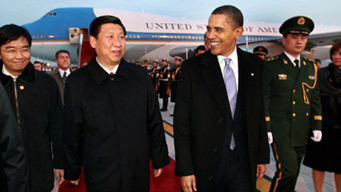 US President Barack Obama arrived in Beijing Monday afternoon to continue a four-day state visit to China after meetings with officials and students in Shanghai. Some will object to Haiti seeking aid from states that are considered to be enemies of the US. Those who have this qualm should ask themselves: If other sovereign countries can act in their own self-interest, why not the long-suffering people of Haiti? What of the US' alliances with the dictatorships and authoritarian governments of China, Saudi Arabia and Sudan--to name a few? The very thought of the US having cordial relations with the genocidal government of the Sudan, should be enough to turn the stomach of freedom loving Americans everywhere. Read his blog post for more info. UN peacekeeping troops in Haiti are facing accusations of using reckless force again after they fired gunshots to ward off a curious crowd earlier this month. The incident started when two UN helicopters were forced to land in the middle of a field after one of them had mechanical trouble. FSRN'S Ansel Herz reports from Port-Au-Prince. Obama is not interested in helping haiti he is only interested in making the united states a socialist country, since 1962 engel vs vitale chrisitanity and morality are not being taught in US schools anymore where we used to be number 1 since then now we are 65 out of 200 nations even some third world nations are ahead of us in literacy. Benjamin rush signer of declaration of independence stated in 1790 that if you take the bible out of schools you are going to waste money on crime and prisons. What we have today are with the exception of a few politicians are some people who will lie and steal to get what they want at any cost and they are products of our universities and schools. Out of the 56 signers of the declaration of independence 2 owned slaves george washington and thomas jefferson the rest where evangical protestant ministers who were zelous chrisitians. George washington inherited his slaves at the age of 14 and he never broke up any of there families in fact he lived in a state where he could not free his slaves so he was the first president to sign the first federal anti slavery law, before the war george washington actively recruited blacks in to his army, and after the american revolution was won ending slavery was voted on in the first continental congress and missed by one voted. The further America gets away from its chrisitan origins the less you can expect out of this government and its people. I don't believe that Obama's agenda for America is socialism. Good medical care for everyone or whoever qualifies just makes good fiscal sense as well as being the humane thing to do in a country that claims to be "civilized." The right-wingers, tea baggers and the Fox News/Glen Beck crowd aside (these folks are more WHITE then AMERICAN!) --it is wrong to insist that immigrants will be included--I believe they should be! Personally, I believe in the separation of church and state. It's much healthier for a country to not be entangled in religiosity--that brings in too much discord. Extremist/fundamentalist of different religions tend to have closed minds and don't practice the charitable tenets of their religions. Obama has a lot of priorities, so obviously Haiti is not a concern. He may or may not be aware of the injustice of US foreign policy towards Haiti. I do think he could have done something to help the people who were slated for deportation earlier this year--but his Homeland Security went on to carry out the previous Bush administration's discriminatory policies against Haitians. That was disappointing... but not the least bit unexpected given that Obama is of a "status quo"/pragmatist mindset. I don't like it and I am very disillusioned by the lack of any "change" as promised--but resigned and not too interested in supporting him for re-election. Hypocrisy and raising expectations just to get elected are what politicians do. Obama is just a politician--no more, no less. Obama has made education a priority and has even got Newt Gingrich and Al Sharpton, along with Obama's new Education Secretary Arne Duncan out promoting education reform together--at least you can take heart from that. No? All three were on NBC's "Meet the Press" this past Sunday talking about their initiative. Religion is not the solution to anything plaguing the world. In fact, the crusades, slave trade and other conflicts and immoral actions were initiated and promoted by Christians. I don't favor any religion, I am not religious at all. I was raised Catholic--but I don't feel that I need religion to keep me from committing immoralities. I am able to do that because I have principles. A lot of people appear to need religion as a crutch. By the way, the healthcare reform bill that is now being discussed in the House is not real reform. Experts say it will only cover 1 percent of the population. I must say, that I am with the Republicans and Conservadems about mandates--I think that buying insurance should not be a mandate and would only be a gift to these corrupt medical insurance companies, who will get a shitload of new business from people who are forced to buy insurance from them or else pay a fine to the government. Real healthcare reform is single-payer--government administered and not for profit healthcare. Hi, I'm an independent journalist living in PAP and you might be interested in some of my recent coverage of Haiti. My latest article looks at a recent shooting incident involving MINUSTAH. Nice blog, you make some good points. Actually christians in america brought down slavery they were called republicans, and 1,300 whites were also lynched in america and a good deal of them were republicans, islam was inslaving black africans 1,000 years before europeans got into the slave trade and muslims were still enslaving blacks a century after slavery was abolished in america. The crusades were started because christians were being persecuted in muslim countries back them as they still are today, and the purpose of the crusades was to stop it.Atheist societies do not last, it is natural for people to have religion in there societies in every culture.Black africans and arabs fueled the slave trade and there were over 2,000 blacks in this country that owned slaves themselves, in fact after slavery was abolished in this country africa sent a delegation of african chiefs to washington DC to beg america to continue the slave trade. All white people are not evil. Back to health care allow people to cross state lines for cheaper insurance and that will bring down costs and add tort reform to bring down costs also. Legal immigrants should have healthcare coverage, illegal immigrants do not respect the laws of our country and we are just going to reward them with free healthcare, the american public is just not going to go for that. I read your excellent article about the shooting incident and made a comment on your website. Great article! Good reporting. I am very pleased. And contact me anytime. Thank you Ansel. Please visit again. Al--Religion of every kind has fundamentalist who commit immoral acts in the name of their religion/god or selfish interests--these elements should be condemned. However there are exceptions to every rule--as they say. One exceptional individual should be credited for his courage and heroism. The religious zealot and abolitionist John Brown. John Brown and other abolitionist did succeed in waking up the Northern populace to the evils of slavery. Although the slave rebellions John Brown had hoped for did not occur, the North was motivated by "the legend of John Brown" to launch the Civil War. John Brown is a great hero, who practiced Christian values--albeit he was not a pacifist. Pacifism is not an option when fighting for freedom and democracy. In Haiti, John Brown was celebrated and his case was followed closely by Haitians. Haitians collected and donated twenty thousand dollars for his bereaved family after Brown was executed. Haitians also named a major boulevard after him. John Brown Boulevard is the main boulevard in the Haitian capital of Port-au-Prince. Newsflash--America was built by people who believed in the separation of church and state. America is not a "Christian" country. In America there are many religions--none is supposed to be given importance over the other. Read the U.S. CONSTITUTION yourself. Religion is a private matter. This matter about slavery is not the topic of this post--I will no longer replay slavery's shameful past with you or discuss healthcare reform in America as it has no bearing on the evils perpetrated in Haiti by the UN and its powerful and unjust Security Council membership. 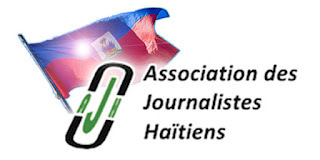 The current brutal occupation of Haiti as sanctioned and supported by the unholy alliance of the so-called "international community," is the topic at hand for which a constructive contribution by yourself or other readers would be greatly appreciated. Please kindly stay on topic in the future or I will be forced to consider not publishing your comments. Thank you.